For the first time, a Montecristo cigar showcases a Nicaraguan puro blend! 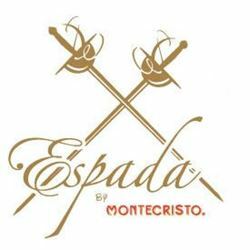 Montecristo is world-renowned for its Cuban and Dominican origins, but for Espada by Montecristo, the brand has teamed with one of Nicaragua’s most famed families of tobacco growers to offer a completely new experience for this time-honored name. As is the case with many of Altadis USA’s (parent company of Montecristo Cigars) most sophisticated blends, Espada by Montecristo showcases the supreme talents of Altadis’ Grupo de Maestros blending team—which is a collection of some of the most talented cigar craftsmen in the world. The Grupo de Maestros team has collaborated with the Plasencia family for this special project, utilizing the family’s revered tobaccos throughout the blend; taking care to select some of the best, most vintage tobaccos within the Plasencia aging rooms. These vintages span back to 2008, using Nicaraguan Habano tobaccos of Jalapa, Ometepe, and Condega (all 2008 vintage) for the cigar’s filler; the binder is Nicaraguan Habano Jalapa (vintage 2009); and the wrapper is a beautiful, Nicaraguan Habano Jalapa (vintage 2010). The resulting experience embodies the full intensity that Nicaraguan soil has become highly sought-after. And while the body is on the full side, nuanced flavors manage to shine through, displaying complex notes of bright citrus and cedar wood, medium-roast coffee, and a healthy dose of white and black pepper.